Antonio Banderas saw Hair on stage with his family when he was 15, and decided by intermission that he wanted to be an actor. He dropped out of high school, but later got an equivalency diploma. He was a struggling stage actor in Madrid for several years, and began appearing in Spanish movies in the early 1980s. He first came to Americans' attention in the bizarre art films of Pedro Almodóvar, including Matador, Law of Desire, Women on the Verge of a Nervous Breakdown, and Tie Me Up, Tie Me Down. 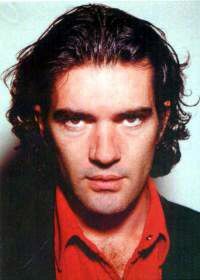 Hollywood came for Banderas, and he's worked primarily in English-language films since he was Tom Hanks' lover in Philadelphia and a bloodsucker in Interview with the Vampire. He played El Mariachi in the two big-budget sequels to the original El Mariachi. He was also Zorro in the listless Mark of Zorro and Zorro 2. He provided the voice of Puss In Boots in Shrek 2, and was moved to tears at the end of the film's premiere.